Occasionally, there has been a suggestion to start a meta question to collect information that might be of interest to the MO community. This is an attempt to start such a thread. Is there any news that you think would be of wide interest to the MO community? Please exercise your discretion in any answers, and your judgement on the appropriateness or significance of any event. Igor Shafarevich died on February 19, 2017 in Moscow at the age of 93. Maryam Mirzakhani has died of breast cancer. A professor at Stanford University, she was the first female (and first Iranian) recipient of the Fields Medal. She was only 40 years old. Sadly we just lost another Fields medallist, Vladimir Voevodsky died suddenly. Marina Ratner, Professor at Berkeley, died on July 7, 2017. Atiyah passed away on Friday (11th Jan), confirmed by Oxford Maths dept, the Royal Society and an obit in the NYT. Alan Baker (1939-2018) died on 4 February 2018. Baker received the Fields medal in 1970 for his work in transcendental number theory. Please join us in wishing J.D. Hamkins the best of luck as Professor of Logic in the Faculty of Philosophy at Oxford University, and Sir Peter Strawson Fellow in Philosophy, University College, Oxford. Hopefully he'll continue his contributions to this site. Jacques Neveu died on May 15, 2016 at the age of 83. A day in homage to the famous french probabilist will be held on may 23, 2017 at IHP. Registration is free yet mandatory. The 2018 Fields medal winners are Caucher Birkar, Alessio Figalli, Peter Scholze, and Akshay Venkatesh. Brief citations and longer descriptions of their work are available on the IMU website. Peter Scholze has explained some of the key ideas in his research on MO, most notably in this introductory post. Andrei Suslin passed away today, July 10 2018 at the age of 67. Andrei has been one of the leading algebraists of the past 50 years, establishing many of the basic theorems in algebraic K-theory, instrumental in the development of motivic theories in algebraic geometry, and a powerful influence in the study of the cohomology of finite group schemes. His mathematics has always been elegant; his attitude has always been one of generosity. 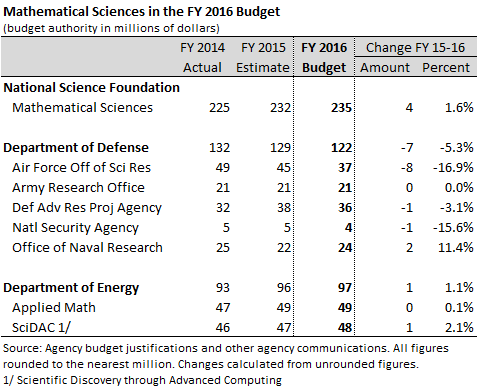 If I am reading this chart from the AAAS correctly, on "Mathematical Sciences in the FY 2016 Budget," the funding for math in the U.S. went down by \$3 million dollars (rounded, without adjusting for inflation) from 2015 to 2016. I would be interested to learn the trend in other countries. "Statement on scientific publications by three national Academies (Academie des sciences, Leopoldina, and Royal Society)"
Will MO have Community Promotion Ads? How to find the meta-thread of an MO-thread at hand? Is there one? Should there be? Why was this question made community wiki?